Historian Richard Bailey speaks during the unveiling of an historic marker across the street from City Hall in Montgomery on Thursday. 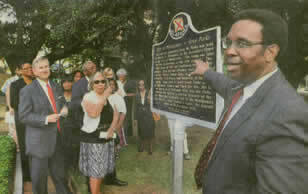 The marker honors Elijah Cook on one side and commemorates the city of Montgomery v. Rosa Parks on the other. attorney Fred Gray before the unveiling.